From the late 1980s onward, low inflation was largely due to positive supply-side shocks – such as the Baby Boomer-fueled expansion of the labor force and the integration of many emerging countries into the global trading system. These forces boosted growth while lowering inflation. And monetary policy, far from restricting demand, was generally focused on preventing below-target inflation. Feb. 27, 2018, 3:29 p.m.
Not “nearly impossible”—impossible—just as setting the “correct” interest rate is. Without price signals, there are no markets. Feb. 26, 2018, 7:27 p.m. I thought Libor is going away at some time in the near future. What are they going to use to set rates then? I am sure it will not be the market. Feb. 25, 2018, 6:38 p.m. The objective of any Price Index is to approximate a cost-of-living concept, as put in Bureau of Labor Statics site in their own words, “What is the cost, at the current month’s market prices, of achieving the standard of living attained in the base period”.That is, Price index measure cost of living. Period. It’s not measuring pleasure or customer satisfaction. In the concept of cost of living Hedonics doesn’t have a place. By the way even if you set consumer pleasure as an objective or as a source of weight parametrization in the price Index, the idea do not agree at all with well established and empirically tested facts in psychology: Satisfaction and pleasure are entirely relative and contextual effects. A Roman 1st century AD reading a papyrus at night below a tremolos candle have the same satisfaction as a modern man or women reading a book on tablet. So the idea of hedonics in price index calculation is doubly ill advised. 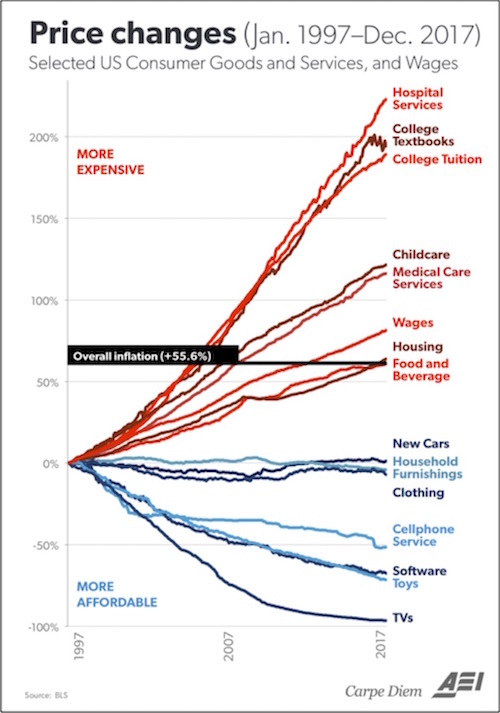 This put, to attribute due to Hedonics a 99% deflation on television sets and other huge deflations on other expenses (especially on entertainment gadgets) is to disregard whole categories in the cost of living concept. Likewise to assume substitution generically and implement it by mathematic devices automatically irregard of the discretionary nature of the items in the consumer basket. 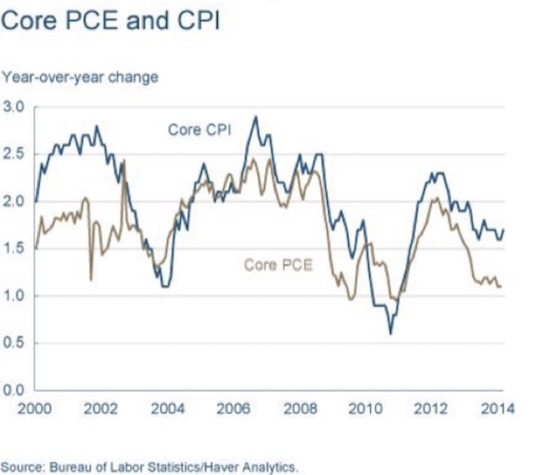 In summary both CPI and PCE are biased lower inflation measures. And it’s not at all a surprise the chronically low inflation irrespective of a tight labor market. Lastly, the author say he don’t believe it is intentionally manipulated. I think that’s not a question of belief but, especially in respect to investing, an heuristically tactical and strategy position to assume (that those price indexes are intentional manipulated). Assume otherwise would be an ingenue attitude and a vulnerable position. Feb. 25, 2018, 6:18 p.m.
John B. Robb, could not agree more. Look back to 1966, the year real money was outlawed for Americans. The Dow stock index is down .85% a year for fifty years to gold. The Dow is up .75% per year in silver. Gold and silver are real money. No inflation in real money and deflation in real manufactured goods. The inflation is in measuring goods and services in fake counterfeit currency. In fake counterfeit collars the Dow is up 6% a year like clockwork manufactured by the fake counterfeiting cartel, the Fed.. We have Communism, a rigged system, transferring wealth from Main Street to Wall Street the way farmers transfer milk from cows to farmers to market. The Fed is not fixing or helping the “economy” what ever that is. The Fed is transferring wealth from Main Street indentured servants to Wall Street fake bankers, fake brokers, fake asset owners, and fake government employees. The system is criminal and if we revert to honest money and mark to market, like we almost did in 2008, the whole house of fake jobs and fake businesses like the FANGs come tumbling down. We need a reset. Protect yourself. No one else can or will. Feb. 25, 2018, 2:26 p.m.
Spot on, I post wherever appropriate that the Fed needs to be regulated by an FDA-like body. We allow the Fed to experiment on 320 million people with minimal evidence of safety and efficacy. We would never allow that with a drug or medical device. If financial companies know the rules, they will act with appropriate risk-taking. To know that the Fed will intervene to save them with new and unproved measures simply perpetuates the angst felt by the general population regarding each person’s financial future. Feb. 25, 2018, 1:23 p.m. If we lived in a free economy lubricated by real (not counterfeit) money, deflation would be the desiderata - and the norm, just as it was before 1913 when the Federal Government began to arrogate powers to itself that aren’t legitimated by the Constitution. The degree of deflation would be an accurate index of actual economic productivity, as opposed to the phony productivity statistics computed today, which are misleading to the point of meaninglessness because they are predicated on another misleading and virtually meaningless construct - GDP. However, even in today’s world, where individuals have to be concerned with what monetary manipulation and counterfeit money is doing to their assets and their economic prospects, it would be possible to track basic price inflation as a measure of trickle down monetary inflation if the manipulators (the government “regulatory” authorities and the financial community that they serve and cover for) wished to do so. An honest CPI would track only the prices of the so-called non-discretionary products and services that a broad survey of middle class households spent more than say 5% of their annual income on, weighted according to the average spending in each of the major non-discretionary categories. An honest CPI would of course include the key categories that the core CPI excludes, especially food and energy, which are two of the biggest non-discretionary items in the average family’s budget. The other key categories that consume at least 5% of almost every middle class family’s budget are housing, essential transportation expenses, medical and medical insurance expenses, miscellaneous consumable household or personal supplies of various kinds, and non-discretionary work-related expenses, including non-discretionary childcare services. An honest CPI would rarely, if ever, change either the composition or the weighting of its categories, first, because most of these categories haven’t changed much over the last 50 years, and second, because the whole point of the reformed CPI that I’m advocating would be to put the focus on sectors like medical services and drugs, that are sham-regulated coercive government oligopolies, to highlight their government underwritten chicanery, so that appropriate reforms can be made. Tape measures made of rubber, and a CPI index that measures different things from year to year, aren’t measures at all, and it’s fraudulent to pretend that they are. That’s why the 1990 version of the CPI tracked at ShadowStats has at least some credibility as a relative measure of price inflation since that time, while today’s CPI has none. 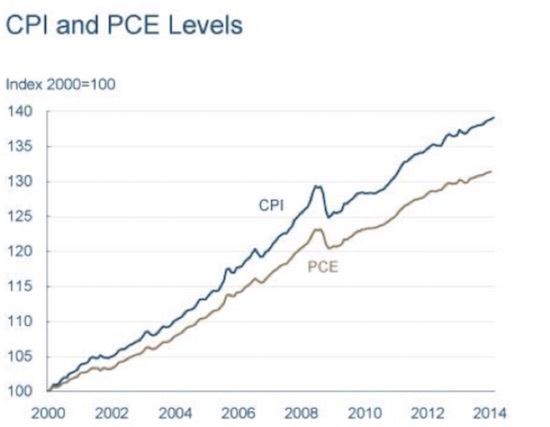 These bogus inflationary indicators you write of (CPI and PCE) are nothing but devices for trying to persuade the American sheeple who aren’t in the top 10% by income that even though they are getting noticeably poorer every year that it must just be them - that there is systemic problem with the current economic financial regime. But that narrative is wearing thing, and when confidence fails in a confidence game, the game is soon up. Feb. 25, 2018, 10:27 a.m.
Two examples of the biggest “ zombie” companies that would look nothing like they do today with reasonable cost of capital are Amazon and Tesla. Just think of the inflation dampening effect of Amazon and other like unprofitable online and/or tech companies on the economy and jobs/wage rates.